The field of biogeography has its roots in the 1960’s when theories were developed to explain large-scale variation in biological diversity. Much of this work focused on colonization of islands but additional work considered tree species, themselves, to function as islands, with greater herbivore diversity on tree species ranging across larger land areas. We plan to explore such biogeographical patterns relative to invasions. 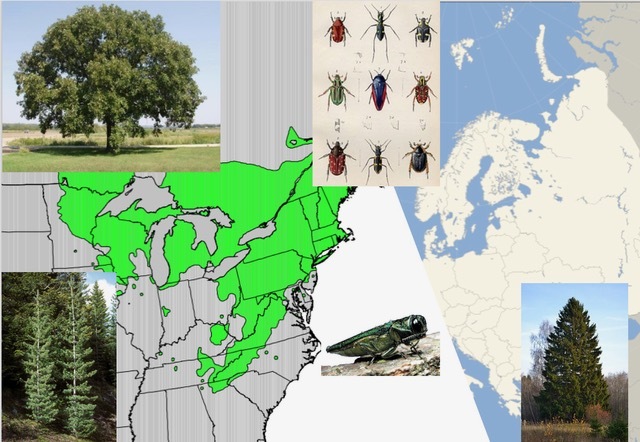 Specifically, we set out to study the diversity of both native and non-native insect herbivores that use different tree species in Europe and North America as hosts and explore the possible drivers of variation among tree species and among regions. We intend to test the hypotheses that both native and non-native species richness of tree herbivores are related to tree species range area and that native and non-native insect herbivore richness are correlated. We will also consider other characteristics of tree species (e.g., growth characteristics) as correlates of native and non-native herbivore diversity.